BandBooker is delighted to represent this young, exciting performer. With her experience performing alongside DJs around the world, including in the USA, Italy, Canada, The Caribbean, Marbella and at private events in The Maldives, there is no better way to enhance your Event or Wedding. She can perform at corporate events, private parties or a club night, freestyling effortlessly alongside a DJ and is an extremely talented and versatile artist. Ellie’s soulful jazz tones and catchy pop licks means that she can bring variety to any event. She puts a unique twist on tracks, free-styling alongside other musicians as she weaves her melodic magic through music with an intuitive feel. An award winning graduate of the Royal Northern College of Music, Ellie has gone on to perform at, many high profile events and for prestigious companies such as Virgin Media, Elite Tributes Group, Make Happen, Disney Cruise Line and Leading Hotels of the World, as well as other Hotels all over the world. This package is the perfect accompaniment to a drinks reception or sit down meal and adds a touch of class to any event. This package is perfect to ease your guest from a drinks reception or dinner into the party mood. Ellie is easily able to move amongst your guests to get everyone in the mood to party. This package is the perfect accompaniment to your drinks reception or sit down meal and adds a unique touch to your special day. I can work any songs special to you and your fiancÃ© into her sets to make your day even more special. 1 x 30 minute set for the ceremony, including any special request for when the bride walks down the aisle. 1 x 45 minute set of background music (jazz, ibiza chill or classical) followed by 1 x 45 minute set of upbeat party tunes to get your guests dancing. 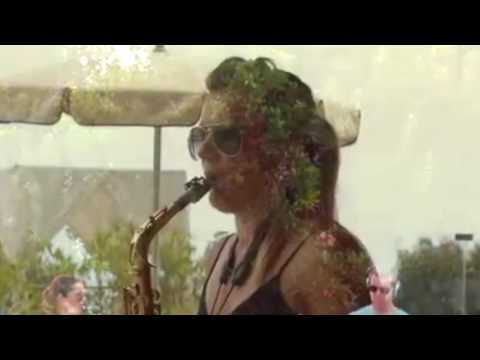 1 x 45 minute set of background music (jazz, ibiza chill or classical) performed by saxophonist. Followed by 2 x 30 minute sets of Live DJ with Live Saxophone adding energy and a unique edge to your wedding party. This great performer can adapt her set to suit your event. Below are some examples of the styles she can perform.